The team behind Botanical have been working on another venture into contemporary inner city living. The team have focussed on implementing a contemporary ageless design with whilst integrating high-end amenities and landscaped gardens to conceive a bespoke unmatched experience. Eden is also a response to one of Perth’s major planning issues; urban sprawl and the lack of diversity in housing typologies. In the controversial debate to achieve a more consolidated Perth, a moderate density housing form is what has said to be needed by industry professionals to infill certain under-utilised voids in suburbia. The unique location adjacent to the Perry Lakes Reserve and Bold Park and being surrounded by predominantly two-three storey townhouses was an opportunity to design a larger housing form that will favourably ‘belong’ in its context. Community acceptance of higher residential densities seems to be one of the largest issues in the ongoing debate. With this being a key factor in developing an outcome for urban infill, Eden needed to be a sensitive and conscious approach to its context through a marriage of form, function and materiality. The dynamic building facades of Eden have taken notes from minimalist masters like Mies and Le Corbusier. The design portrays feature gridded concrete columns and dissected stacked forms clad in rich and timeless materials and textures with organically flowing vegetation clinging to the balconies feature garden beds to soften the overall masses. The sliding screens on areas of the facades play with the concept of ephemeral structures and encourage movement that reflects the occupants’ current mood and lifestyle. As the public perception seems to believe with moving to an apartment or town house is a compromise of outdoor space, close attention has also been paid to the concept of an indoor-outdoor experience in all the apartment typologies. The balconies and courtyards are generous and intend to be an extension of the combined living internal areas only separated through an invisible barrier. The ground levels feature two-storey townhouses with courtyards, terraces and multiple living areas. Level one to level three contain assorted apartment configurations facing outwards to the reserve or inwards to the amenities, and the fourth level features expansive penthouse living that’s size would mimic a spacious one-storey home. 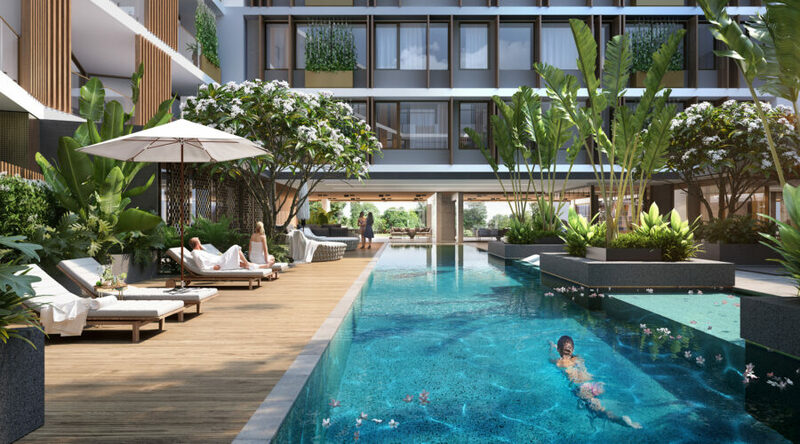 Dappled light from the landscaped gardens will dominate the surfaces throughout the resort-style amenities which include a 25m pool, viewing deck, gym and entertaining areas. Ponds and waterways have been designed into the circulation and transitional spaces to add further depth to the outdoor spaces. In many ways, these resort-style mannerisms produced by the featured amenities have been one of the initial motivators for Eden to become something extremely unique, a bench mark for the type of housing that can be incorporated into the voids in inner city Perth, a step towards a better consolidated, efficient and aesthetically diverse city.